At the halfway point of our IRIS Plastic Monster tour, we would love to share a bit about what’s going on and also what makes us re-think how we deliver our services. 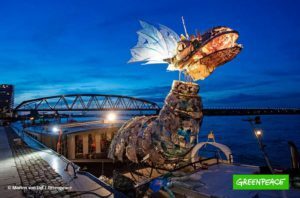 Greenpeace has hired our ship and its services on their mission to address the producers of single-use plastics to start working on alternatives that stop polluting our planet with the exponentially growing plastic waste which is causing more and more problems in our food chain. Not only by recycling but with better long term solutions of alternative packaging methods to drastically reduce waste. As customers, we also need to change our behaviour and rethink. We did! Like a hummingbird carrying a little drop of water to a bush fire, we can do our own small bit to help alleviate the problem. There’s no excuse for single use….the slogan of the Greenpeace campaign. We will stop providing the water bottles for single use only. For this year we will still give you a bottle to take home but will re-use those that remain on the barge. When these bottles are gone we will replace them with bigger flasks as a more sustainable solution. For our deliveries, we will consider the way we receive our goods. This is not an easy job, but we will work on it. There was another revelation on board this week. Greenpeace ordered a vegan menu for the tour, which was something our chef, Aline, really loved as she took a course in England in vegan cuisine. To be honest, we were a little sceptical and joked about how much weight we might lose. But even our greatest meat lovers (not mentioning names) love our food this week! So now we feel very inspired to talk about how we could make this work with our “regular” menu on board. We are, of course, curious to know how our guests would feel about this, so we will try some taste testing with our first groups to see if they get as enthusiastic about it as we have. There will be a second post with Aline’s vegan recipes soon! Hi! I am Lenny, the elderly lady in the picture, next to me my son and bike guide Wouter. In the midst of a tour in Germany, on what we like to do most: biking and guiding you through our lovely countries. I like to share my stories with you here!